Only 83 left in stock - order soon. VERY DURABLE: Can last for more than the life of 7 kitchen sponges. NO MORE SMELLY SPONGES: Does not absorb and retain foul water and residues. LOW MAINTENANCE: Easy to sanitize. Just wash with water & air dry. ODOR FREE SCRUBBER IS VERSATILE: It's multipurpose so you can use it however you want it for dishes, pots, and pans. You can even use it to clean your tub or sink. DURABLE & LONG-LASTING: Sponges will melt like cotton candy when you are someone who likes to scrub your kitchen items squeaky clean. 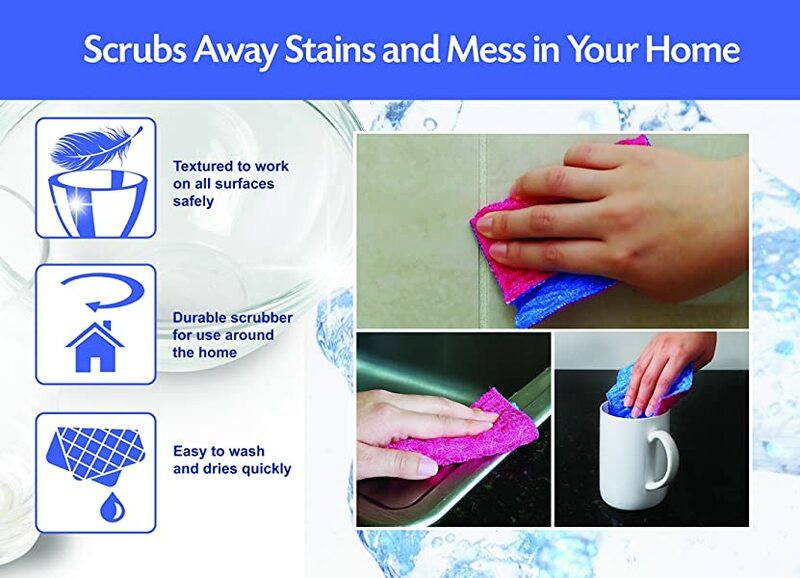 This Dish Scrubbie will last longer to as much as 7 regular sponges. NO SPONGE SMELLS: As long as you take care of it, this odor-free scrubber will never stink because the special material doesn't keep food particles in. And smells just don't stick to this material at all. You know it's clean because it doesn't smell. What do you need for a sponge alternative? It's multipurpose so you can use it however you want it for dishes, pots, and pans. You can even use it to clean your tub or sink. It's great for those expensive stainless steel, non-stick pots and pans you don't want to scratch. 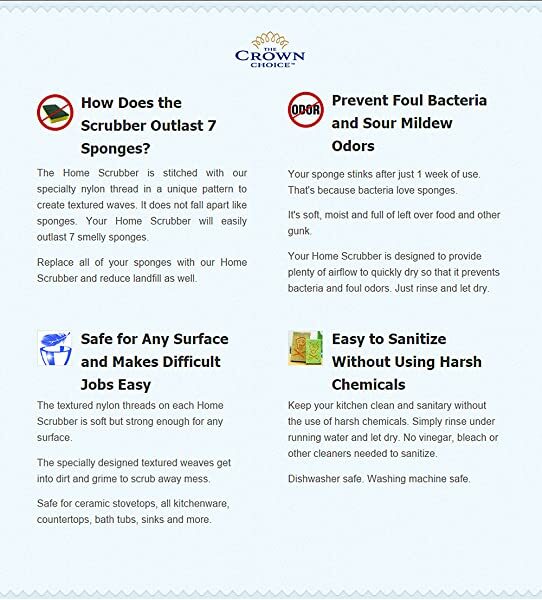 Here's how you clean The Crown Choice smell-free scrubber. Put the cloth in running water then let it air dry. Compare that to sponges that you need to microwave, or soak in vinegar, or spin in the washer. That's so much effort to do something that will have no real effect on the bacteria. It can take out most leftover food and gunk on your plate or crystals with virtually no effort. But it won't ruin it with scratches. The product is certified non-scratch so you can scrub to your heart's content. This all-purpose scrubber will cut your cleaning time in half. The Crown Choice sponge alternative will last longer to as much as 7 regular sponges. That's quite the savings in the long run. As long as you take care of it, the odor-free scrubber will never stink because the special material doesn't keep food particles. Why is this Dish Scrubbie solution the best in the market? The Crown Choice is a trustworthy brand. We've been in business for more than 3 years now. You can visit our product page and see all the wonderful reviews about this product. You can clean it by washing it under running water then let it air dry. That's it. You can toss it in your dishwasher or washing machine too. And since it's made to air dry faster you can use it right away. Q: Are the scrubbers safe to wash crystal or glass drinking water glass? A: Yes, all of our scrubbers have been tested to be safe on crystal and glass. On highly polished surfaces and other very delicate areas, it is better to test first. Q: Can I use these on cast iron pots and pans without scratching the pans? A: Yes, you can. I use them on all my non-stick, stainless steel pots and pans. Q: Can this be used on non-stick cookware? A: Yes. Work on all non-stick cookware without scratching. Does wonders without worrying about the mess. Q. How many do you get in a pack? A. There are 3 and they are long, if you wanted to you can cut them into halves. A. 10 by 10 inches. Q. Can this wash or clean even greasy dishes? A. Yes, I used it for pots, pans, and greasy dishes. Worked well on everything washed. Q. What is this scrubber made of? A. It's made of nylon a non-porous material that will not attract bacteria or smells. Q. Does it remove old stains on stainless steel dishes or just the new ones? A. Maybe not old stains. People use them with liquid soap scum removal products to remove soap scum from even bathroom shower walls without damaging the tile. Q. Can you use it with bleach? A. Diluted bleach maybe. But to sure just use it with soap or something less harsh. Q. How often does one need to be replaced? Average use of daily dishes? A. People claim using the product for more than a month with no sign of wear. They use it exclusively for dishes for 2 people. Q. How do you air dry this odor free scrubber? A. You can hang it along with your clothes. Or if you have a sponge holder, hang it near the hook. Get the one pack strong and durable dishcloth to see that's it's the superior solution than smelly sponges. No smell discloths are the best cleaning tool for dishes and other kitchen utensils. They are chemical free cleaning rags that are scrubbing machines. Cleaning will be faster and easier using this kind of dishwashing tools. The scratch free scouring pad is like tough washcloths. This means they're not sponges. It's actually a nylon dish cloth that don't absorb smells. It's so easy to clean your dishes and it doesn't take much time to air dry these tough washcloths. Sponges tend to disintegrate within a few days of heavy use. A dishwashing pad is better than sponges because they are durable even under heavy use. This nylon dish cloth can outlast 7 smelly sponges. I’ve been using those green scrubby pads for decades but no more! I really like these pads. They seem gentler than the green pads, but just as effective. They suds up with a few drops of soap and are good for scrubbing pots, plates, and counters. I’m a convert! Thanks for the 5-star rating, Mom23! Thanks for the kind words. Pricing has many factors that are beyond our control like the platform raising fees and things like that. Thanks for the 5-star rating, Noel! I have been using these sponges for a couple of week. They work well on dishes and they dry quickly and odor free. I am happy with them. Thanks for the 5-star rating, MW! I'm very happy with this product. It has made doing the dishes a breeze. Very easy to rinse clean, and ready to use again. Would strongly recommend this product. Thanks for the 5-star review! I'm happy our product made it easier for you. Received a couple weeks ago. So far, this scrubbie is great. And most importantly: NO ODOR! Win!!! Thanks for the 5-star review, Brian. BEST DISH / POT/ GLASS CLEANER EVER. Thanks for the 5-star review, Mark. Good sponges - thin easy to clean with and easy to rinse thoroughly!!!! You get it, Joanne! And Thanks for the 5-star review. Just remember to wash it under running water then air dry. Easily the best scrubby pad I have ever owned!!! Impressed! Finally, a product that lives up to their word. It works excellent and is truly odor free. Had to leave a review to give credit when credit was due. Thanks for the love! And thanks for the 5-star review. Great sounds good to me.Thanks for the 5-star review. These are my new favorite. Theyâ€™re great on stainless steel pots and pans and when they get dirty, you can toss these little suckers right into the dishwasher. Yes, yes, yes! Thanks for making our product your favorite, Todd! And thanks for the 5-star review. As long as you realize that you still need to do some scrubbing, sometimes with effort, you'll like these. They don't seem to scratch and work well on both non-stick, ceramic, and steel pans. Thanks for the 5-star review, Tony! Very happy with these dish cloths!! Thanks for the 5-star review, MzKL! Work well as described and hold soap, rinse out easily. Wish the colors were cuter; I got gold and pink! Thanks for the 5-star review, Carole! Works great to scrub food off of plates, it doesnâ€™t smell after a few days, and my hands donâ€™t feel dirty after using it. Great stuff! Thanks for the 5-star review, Daniel. This dish cloth is very sturdy and the best part is that it releases particles easily on rinsing and doesn't seem to have the same potential to harbor germs as sponges do. That's all correct! Thanks for the 5-star review. Works very well on stainless steel sink, stove, and porcelain sink. I especially liked how you can adjust the shape like a dishrag, but way better. Most scrubbing pads are stiff and inflexible in small spaces. That's a great tip, etb! Thanks for the 5-star review.